Last week my family went on a very enjoyable vacation to New York City; I’d been there once before, but Susan and the kids hadn’t. One highlight was St. Patrick’s Cathedral, which was both architecturally and religiously inspiring, and I spent an hour photographing the inscriptions, bas-reliefs, and other details. 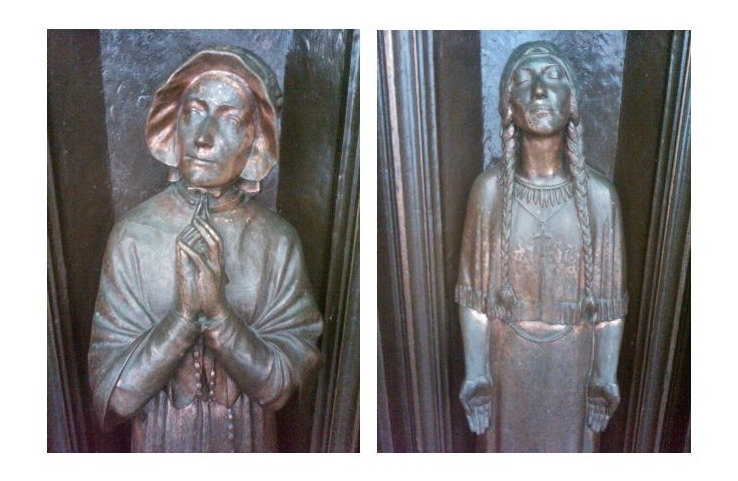 I took the above photographs of two figures sculpted into the imposing bronze doors: they show two of the very few American-born saints, Elizabeth Ann Seton (also known as Mother Seton) and Tekakwitha (also known as the Lily of the Mohawks). Tekakwitha was just canonized last month, and obviously the doors were sculpted decades ago, so it’s interesting that they chose a figure who was beatified but not yet a saint. On a puzzle-related note, we did some letterboxing, and the placers really showed some ingenuity to hide their boxes in the heart of America’s most densely populated city. Despite the hiders’ resourcefulness, only three of the seven boxes we searched for were still in place. One was near the Wall Street bull, and one was near the Balto statue, both of which were on our must-see list anyway because of the kids’ love for animal statues. My favorite, however, was one hidden in Central Park by a group calling themselves the Woodland Poets; the clue consisted of a crossword puzzle to solve, and the box turned out to be near a monument to one of my favorite writers, who was quite a puzzle enthusiast himself. Curiously, the rest of the Woodland Poets’ puzzle letterboxes all seem to be in New Hampshire, so unfortunately we didn’t get to find the others.